These dressed up flip flops are perfect for a seaside ceremony on the beach or for the honeymoon. There's nothing worse than wanting to hit the dance floor but being stuck in your seat due to uncomfortable shoes. If you want to be sure your dance floor is packed on the big night, get these party and wedding flip flops as a favor for your guests. Our selection of personalized flip flops at Weddingstar offers an easy way for anyone in uncomfortable dress shoes to let loose and bust out their best moves. And with the option to customize your design, it's also a fun way to mark a special occasion and give your guests something they'll truly appreciate.Fancy FeetGetting dressed up can be fun, but wearing tight dress shoes or teetering on high heels can cause some serious foot pain. That can keep people off the dance floor or even send some home early, which is why it's always a good idea to have these personalized sandals on site. Flip flops are easy to slide into and instantly relieve any of that discomfort your guests may be feeling. They'll be inspired to hit the dance floor and enjoy the event until the very last minute when they have these comfortable and stylish shoes on their feet.Custom is CoolThough any flips flops would relieve your guests' feet, these sandals go a step further by being customizable for your event. You can pick from different colors, sizes and designs to fit with the theme of your celebration. They are especially popular for weddings where dancing will be main feature of the reception. Couples who want their guests to dance the night away should definitely stock up on these stylish shoes in a variety of sizes before their wedding day arrives. 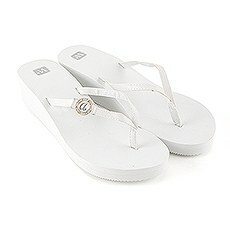 Shop at Weddingstar to find a great selection of personalized flip flops to use as party favors.